Brewery Ommegang is an American brewery based out of Cooperstown, New York that has really taken the Belgian theme to heart. They brew only Belgian-inspired beers and even designed the brewery to ape traditional Belgian farmhouse architecture. Pitching your American brewery as thoroughly Belgian takes either confidence or madness, so you know the beers are either going to be awesome or terrible. Based on the fact that Brouwerij Duvel Moortgat bought the joint back in 2003, I'm pretty sure they're the former and not the latter. What better beer to start with than the one that shares the name with the brewery. 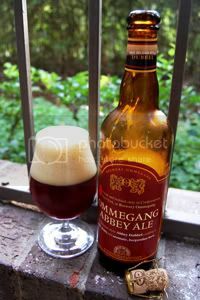 Like a band's first album being "self-titled," Ommegang named their first beer Ommegang Abbey Ale. A traditional-style Dubbel, Ommegang picked up a gold medal in the Dubbel category at this year's World Beer Cup. Looks like these guys really can walk-the-walk when it comes to their Belgian credentials. Meditate on this dark ruby elixir. Breathe in its deep emanations of fruit and spice. Is that clove you smell? Licorice? Fig? Sip serenely as revelations of honey, toffee, chocolate and dark dried fruit delight your senses. Can a beer be holy? you wonder, and Where can I get a grail on-line? This burgundian brew gives off a variety of aromas, including plum and cinnamon, and packs in flavors such as caramel, toffee, and licorice. At 8.5% abv, it is known to cause spontaneous meditation. My order from GrailsOnline.biz hasn't shown up yet, so it looks like this tulip is just going to have to do. Appearance: A dark, murky brown body capped by a creamy, tannish head that features brilliant growth, good retention, and little lacing. Aroma: Burnt sugar dominates over spices, dark fruit, and mild booze. I could stand a little more intensity, but what's here is good. Taste: A burnt sugar and caramel malt body accompanied by lots of spicy and fruity notes. There's a lovely flourish of alcohol towards the end, but the bulk is hidden masterfully. The aftertaste is spicy and boozy. Mouthfeel: A slightly fuller than and nicely creamy medium body with moderate carbonation and drying finish. Some slight alcohol burn in the mouth. Drinkability: About average for the style; a slower beer but rather far from sipper territory. Verdict: Ommegang Abbey is a thoroughly tasty proposition and nicely authentic for an American brewery's Dubbel. Well worth a try.